Meral Sahin owns a wedding shop in Keupstrasse, Cologne, Western Germany. There is no other street quite like it in Germany. Visitors entering the Keupstrasse are greeted with brightly-coloured fairy lights spelling out “Welcome to the Keupstrasse” in German. Once inside,however, Turkish is ubiquitous: this is the heart of the Turkish diaspora. In the 1970s, the street iswhere Germans discovered baklava and Turkish pizzas for the first time. It’s hard to believe that this 700 metre stretch of road nicknamed Little Istanbul is 3000 km away from Ankara. There isn’t a single ‘traditional’ German shop in sight on Keupstrasse. Here, women in headscarves can stroll down the street before heading to the mosque nearby. They can then amble along to Music Gala, a record shop blasting out the latest hits from Istanbul. 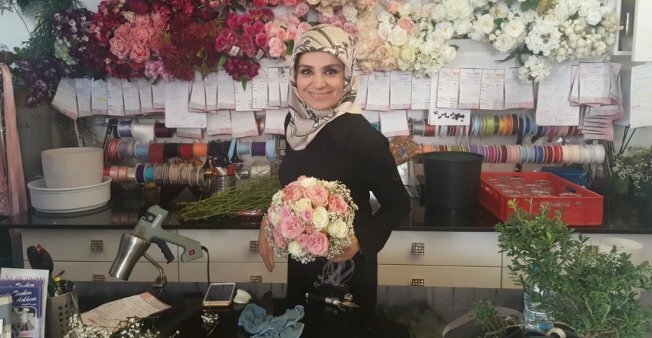 Couples come to the area to organise their wedding in one of the many specialised shops and then whet their appetite in Özdag, a bakery that specialises in bespoke wedding cakes that opened in the 1980s. Turkish pizza restaurants and kebab shops stand cheek by jowl with jewellers selling the latest fashions from Turkey. On the terraces of the many bars lining the street, people sip cardamom-flavoured coffee rather than a ‘mass’ – a pint of traditional German beer. “Our customers come here because they feel nostalgic. All these small shops packed so closely together and where everybody knows each other reminds them of home,” explained Muhammed, a 32-year-old German of Turkish origin who owns a local jewellery shop. Recently however, shopkeepers have had more on their minds than business. Everyone here is keeping a close eye on Germany’s general election Sunday. The diplomatic crisis brewing between Berlin and Ankara for over a year has left a bitter taste. The German government’s official recognition of the Armenian genocide last year, and Angela Merkel’s decision earlier this month to halt discussions on Turkey’s EU membership have added to their worries. Many in Germany’s 700,000-strong Turkish community will turn out to vote on Sunday but the Turkish president’s call to German-Turks not to vote for the Social Democratic Party (SPD), the Christian Democratic Union (CDU) or the Greens was met with deep unease by many of them. Tensions over these issues are palpable here more than anywhere else in Germany. “When Turkish politicians came to see us here they were surrounded by a small army of bodyguards and when there were pro-Erdogan rallies nearby, the police blocked off the streets to prevent any strife from spreading,” explained Muhammed. Issues around a Kurdish referendum set to take place on September 25 haveadded fuel to the fire. Some of Keupstrasse’s shopkeepers are Kurds. “There are tensions, but only among a small minority,” said Servet, the head of the Özdag bakery. Servet does not want these issues to tarnish the street’s reputation, any more than it already has. The street hasn’t recovered from a bomb attack in 2004, which injured 22 people. For seven years, the investigation pointed towards score-settling among the community but in 2011, a group of neo-Nazis was found guilty. But the damage was done, and the few traditional German shops that remained, closed. For many years, Meral Sahin has strived to improve the street’s image. Sahin, an elegant woman in her forties, owns a wedding shop on Keupstrasse and also heads the local tourist office. She is considered by many locals to be the street’s ‘fairy godmother’. Newspaper cutouts and photos pinned to the wall in her shop stand out among the bunches of flowers and glitzy wedding decorations. In one photo, Sahin is seen next to Martin Schulz before he resigned as president of the European parliament to stand in these elections for the SPD. On another, she is seen walking in the Keupstrasse beside the former German president Joachim Gauck. On a third, she is posing next to the Turkish leader, Recep Tayyip Erdogan. “I helped to decorate a room where he came after a meeting in Cologne in 2007,” Sahin explained. Would she do it again? “It was in 2007,” she replied almost sheepishly. Meral Sahin doesn’t only attract celebrities to the area. She is behind the proliferation of wedding shops on the street. “It means that women can come with their partners, and so when they shop, it changes the atmosphere,” Sahin smiled. “Before, there were mostly men hanging around in the streets. It didn’t look very good”. When Sahin talks about the Keupstrasse, she always says ‘we’, referring not to the Turkish community there but to Germans as a whole. The diplomatic spat between Berlin and Ankara affected her deeply as it made her feel like an outsider. “The attacks against Erdogan became a criticism of the entire country, and left out all of those who don’t agree with the current politics in Turkey,” she said. Sahin will vote on Sunday, to protest against the anti-immigrant party, the AfD. Muhammed will also cast his ballot - for Martin Schultz. Historically, Germany’s Turkish community swings to the left. Muhammed also feels that the SPD candidate was less harsh towards Turkey than the German chancellor Angela Merkel. Servet, the baker, is heeding Erdogan’s advice: he won’t back either of the major parties. Despite their political differences, both Meral and Muhammed share similar worries. They fear that the political tension between Turkey and Germany will make it harder to win the hearts of the other inhabitants of Cologne. “The Keupstrasse must be a bridge between our cultures,” Muhammed explained. “People here can find the best Turkish fare and the cheapest quality goods than anywhere else, that’s what is important,” agreed Servet.